After reading the synopsis for Struck, I was extremely excited to start the book. It sounded completely different than anything I had read lately, and I love finding books that are different from the norm. Struck definitely did not disappoint. Mia has an addiction; lightning. She’s addicted to the lightning that has struck her more times than she can remember. This puts not only herself, but anyone around her in danger. With the city of Los Angeles in a state of disaster, two rivaling cults vying for her attention, and the end of the world bearing down on her shoulders, it’s up to Mia to find the power within herself to save the people she loves. Mia was an interesting character. She was definitely determined to do whatever she had to do to keep her family safe, and she was not a person that was easily swayed. Her addiction to lightning was fascinating. Mia’s love interest in the story is the mysterious Jeremy. I like that the romance between the two didn’t overpower the storyline of the book. However, it did come off as a bit awkward and rushed for me. I think that is because I didn’t really know if I truly liked Jeremy up until the last few chapters of the book. The world that the author created in the book was easy to envision, eerily enough. This is definitely something that I could see happening in real life; massive earthquakes, and other natural disasters leaving people displaced and helpless. And I could definitely see cults taking advantage of people’s fears during a time of chaos and doing exactly what happened in the book. The book had lots of action and suspense, and that definitely kept me flying through the pages. Overall, I found this to be a very intriguing read. I was hooked to the pages. I should also mention that I love the cover, it's awesome! I’m very curious to read more from this author in the future. Great review! I LOVED this book more than I expected to which was a nice surprise. I really hope there's a sequel in the works! This book wasn't even on my radar until a couple of weeks ago and now I can't wait to get my hands on it! Everyone seems to love it. I'm reading this now and almost done with it. I agree with your review. Thanks for sharing it. 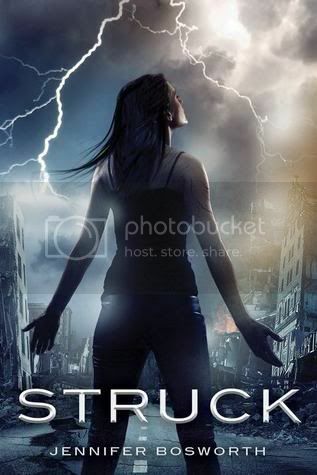 I definitely enjoyed Struck's originality - and I think that's probably one of the better book trailers I've ever seen! I keep seeing this around, but I still can't figure out how the lightning ties in with everything. Guess I'm going to have to read it to find out. I get a little freaked out by natural disasters, though. I totally love the cover! Thanks for the great review. I hadn't heard of this book but I think I'll add it to my wishlist. Great review! I really enjoyed this book and I'm glad you hear you liked it too :) I loved Jeremy from the start, even if we didn't know which side he was playing on! The romance was a wonderful sprinkle of yumminess in the otherwise intense storyline! It really was eerie how easy it was to envision the decimated world Mia lives in. A very well-drawn world. And that cover's fantastic--it's what had me all excited about the story (well, more excited). I thought Mia's lightning addiction was fascinating too, I've never read about anything quite like it! I wasn't sure about Jeremy for most of the book either, but he grew on me by the end! Glad you enjoyed this one too Christy, thanks for the review! Ooh, glad to hear this one doesn't disappoint! I've been intrigued since the beginning too. Can't wait to read it! Fab review :). Great review, Christy! I loved this book and am enjoying reading about the different things everyone picked up on. You've described Mia very well. Two thumbs up!